Posted August 17, 2016 by Bailey Heard & filed under Blog, FeaturedOnHomePage. Last night I was binge-watching the Olympics and catching up on the women’s gymnastics team finals. I couldn’t help but get nostalgic after team USA won the gold. 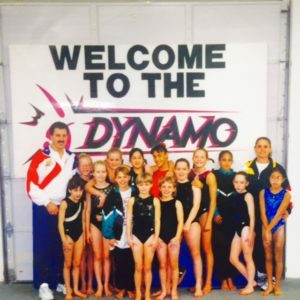 My thoughts took me back to the 1996 Olympics…The Magnificent 7 was the name of the USA women’s Olympic gymnastics team. It was the summer before 6th grade for me. As a level 6 competitive gymnast, I ate, slept, and breathed gymnastics. It was all I thought about. Watching the Magnificent 7 take home gold after Keri Strug came back from an injury was the most inspiring thing I’d ever seen. Right then and there I decided I, too, wanted to become an Olympic gymnast. First things first, I chopped my long blonde locks off to look like the Magnificent 7 team captain, Amanda Borden (think chili bowl, people). Clearly, this was an impulsive decision, as I cried in the bathroom of the salon after seeing the results. Despite being made fun of every day of 6th grade, I was committed to looking the part of an Olympic gymnast. On Christmas morning, my parents opened our garage door to reveal a signed balance beam and mat from Shannon Miller’s gym (one of the Mag 7 gymnasts). In between my four-hours-a-day, five-days-a-week practices you could find me on my new balance beam or twisting and flipping on my trampoline, in my own little world, pretending to compete in the Olympics. I remember practicing my autograph in class and underneath my name I put the Olympic Rings, followed by 2004. I watched every possible biography of all the greats: Nadia Comaneci, Mary Lou Retton, Shannon Miller, among others. I eventually mustered up the courage to tell my head coach about my Olympic dreams, and instead of laughing in my face or telling me I didn’t have the talent to accomplish this dream, he typed up a 12-page letter about the dedication and commitment required to achieve Olympic-sized dreams. This gesture deeply impacted me, because I felt someone I admired and respected believed in me and took me seriously. A couple of years later, I realized I was not willing to make the sacrifices required of me to achieve this dream and my interests were gradually taking me in a different direction. I did, however, frame the letter and have kept it as a reminder of what is required to achieve greatness in whatever I decide to commit to. Here’s what struck me the most about watching the Olympics last night– the majority of the time it’s the limitations we put on ourselves that hold us back from achieving what we want. Watching the 41-year-old gymnast, Oksana Chusovitina, compete on the vault only validated my point. I never thought it was possible to compete in the Olympics as a gymnast past the age of 25 and that belief was obliterated after watching this seven-time Olympic competitor and mom compete last night. As a gymnast, I was worried I’d become too tall (I’m 5’3), too old, not be flexible enough, the list goes on and on. I was constantly putting limitations on myself and comparing my skills and my body to the other competitors. I defeated myself in my mind before I ever got to see what I was fully capable of. How many of us can relate to selling ourselves short through comparison or limiting our capabilities? I now realize my thoughts about myself are what hold me back the most in life from creating the life I imagine is possible. I will forever be inspired by my late husband, Andrew, and how he wrote two books, a blog, spoke almost every weekend, officiated weddings, and bought over 10 rental properties for his family’s real estate investment company in between chemo, radiation, and gamma knife surgery over the final 10 months of his life. It’s a reminder of what’s possible when we believe we can do something, focus, commit, and do the work. I woke up this morning with one question on my mind: What more am I capable of today? Ellie told me yesterday, “Mom, I believe God gave each one of us a gift.” I think so, too, Ellie. Let’s challenge ourselves to remember what those gifts are, to use them, and to grow in them in order to reach our full God-given potential. Because when we positively change our individual lives we have the power to change the world. Love and Blessings. PPS – If you’re looking to motivate, inspire, and encourage a group you are a part of, I would love to come share my message of how each and every one of us can transform our most challenging times into the most meaningful and purposeful path for our lives. Email me at bailey@baileyheard.com.